The world population of inhabitants of greater than 60 years of age has doubled since 1980 and is predicted to reach 2 billion by 2050. Trauma is the sixth leading cause of death in patients over 60 years of age. Though this growing elderly population only comprises 12% of overall trauma patients, they consume considerable medical resources and are more likely to require hospital admission. An aggressive approach should be established throughout the management of the elderly trauma patient in order to reduce mortality and the incidence of permanent disability. In the past decade, the overall mortality rate due to trauma decreased. However, in the elderly population (>65 years of age), the incidence of trauma-related mortality is still high, mostly secondary to falls. Elderly patients have a higher mortality after trauma as well as a higher complication rate, specifically for pulmonary and infectious complications[7, 8]. Trauma in the elderly clearly poses special challenges to the physician, with physiological changes of age impacting morbidity and mortality. Notwithstanding, little information is available regarding risk factors that aid in predicting increased mortality in this population. More so, there are significant findings in the literature showing that severely injured geriatric trauma patients who do survive their hospitalization have appreciable long-term survival and return to independent living[9–11]. Our study is a retrospective review of our experience with severely injured elderly patients. Our primary objectives were to describe the different pattern of injury among the elderly and define and analyze predictors of in-hospital mortality. Our secondary objective was to determine whether pre-existing co-morbidities had an adverse effect on outcome. Hadassah University Hospital, Ein Kerem Campus, is a tertiary medical center and the only level I trauma center in the Jerusalem vicinity. Emergency medical services (EMS) in Israel are provided by a government funded national organization with regional control. The catchment area incorporates Jerusalem and nearby towns and villages and includes a population of approximately one million inhabitants. Inclusion criteria to the study included all trauma patients ≥ 60 years of age who presented to our Level I Trauma Center with an injury severity score (ISS) ≥16 between January 2006 and December 2010. Patients who were pronounced dead at the trauma bay or had a do not resuscitate order were excluded from the study. Data was retrieved from medical records and the trauma registry database. The trauma registry is a prospectively collected database that is updated daily by dedicated personnel and has institutional review board (IRB) approval. All charts were retrospectively reviewed for demographics, ISS, GCS (Glasgow Coma Scale) at presentation to the emergency department (ED), mechanism of injury (MOI), body regions injured, pre-existing co-morbidities, intensive care unit length of stay (ICU LOS), hospital LOS, surgical interventions, complications, and in-hospital mortality. Patients were divided into 3 age groups: 60-69 years, 70-79 and ≥80. The main outcome measure was in-hospital mortality. This was defined as death which occurred at the trauma center. In order to avoid missing late deaths which were directly related to the trauma, we chose to include patients who were discharged from the hospital but died within 30 days of the traumatic insult regardless of patient location at time of death. Co-morbidities were defined as presented in Table 1. There were 417 trauma patients older than 60 years of age and with an ISS ≥16 who presented to our trauma unit during the study period and who met the inclusion criteria. One patient was excluded due to incomplete data. The mean age of the study cohort was 76.9 years (±9.6) and there were 232 males (55.6%). 174 patients (41.7%) were ≥ 80 years. Mean ISS for the whole cohort was 22.9 (±8.4). 230 patients (55.3%) had an ISS of 16 to 24 and 186 patients (44.7%) had an ISS ≥25. The demographic and clinical characteristics of the patients according to the age groups are noted in Table 2. The rate of males declined significantly with age. Although ISS and the median number of regions injured decreased significantly with age (both p < 0.001), mortality increased significantly. The most common MOI for all patients was falls (n = 271, 65.1%) followed by pedestrian injuries (n = 71, 17.1%), motor vehicle collision (MVC) (n = 49, 11.8%), burns (n = 11, 2.6%), and other causes (assault, penetrating trauma, etc, n = 15, 3.6%). The MOI was different between the age groups. The rate of fall as a MOI increased significantly with age (p < 0.0001) while the rate of patients involved in MVC either as pedestrians or in a vehicle decreased significantly with age (p < 0.0001). Data are presented as mean (and SD) or number of patients (and percentage points) *. † Chi-squared test for trends. ISS Injury severity score, GCS Glasgow coma scale, AIS Abbreviated injury scale, ICU Intensive care unit. Head and facial trauma (median AIS = 4, range 1-5) was the most common type of injury (339/416 patients, 81.5%). Thoracic injuries occurred in 39.7% (165/416) of the patients, with rib fractures and/or flail chest being the most common thoracic injuries (88/165, 53.3%). Cervical spine injuries were present in 9.6% (40/416) of patients. Thoracic, lumbar, and sacral spine injuries were present in 10.1% (42 of 416) of patients. Abdominal injuries were present in 8.9% (37/416) of patients. Pelvic fractures were present in 12.5% (52/ 416) of the patients and long bones fractures in 20.7% (86/416). Figure 1 shows the injury patterns according to age groups. Head and facial injuries were significantly more common in the ≥80 age group compared with the other groups (p = 0.0006). 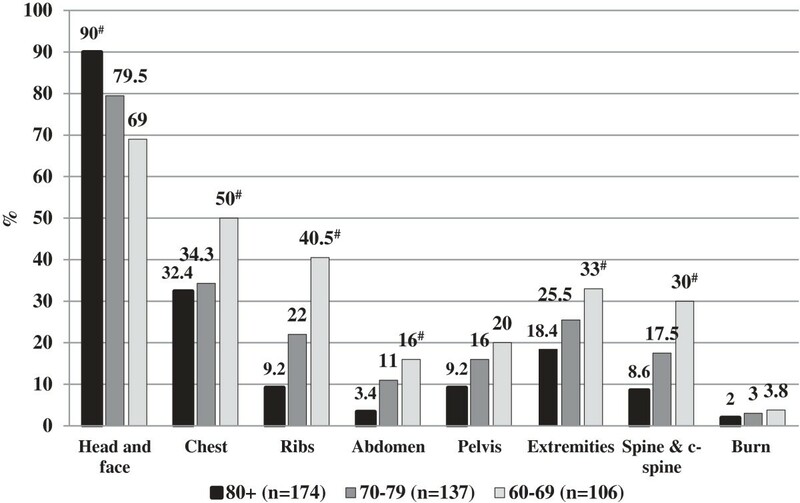 Injuries to the torso, extremities and spine were significantly less common in the ≥80 age group. Injury patterns according to the different age groups (data shown as percentage points). # p < 0.05 Chi squared test for trends. The impact of pre-existing co-morbidities on outcome was compared between patients who died and those who survived. On univariate analysis, only chronic renal failure (CRF) was associated with a poorer outcome (11 patients [14.9%] in the mortality group vs. 20 patients [4.8%] in the survival group, p = 0.013). Analysis of co-morbidities by the different age groups (60-69, 70-79 and ≥80) showed that hypertension (HTN) (16.2%, 43.1% and 49.4%, respectively, p = 0.035) and the chronic use of anti-coagulant treatment (4.8%, 9.5% and 12.6%, respectively, p = 0.018) were more common in the older age groups. Not surprisingly, the mean number of co-morbidities per patient increased significantly with age (0.77, 1.3, and 1.4, respectively, p = 0.023). Eighty nine patients (21.4%) developed a total of 143 complications during the course of their hospital stay. Pulmonary complications were the most common and included pleural effusions (32, 7.7%), pneumonia (21, 5.0%) and atelectasis (20, 4.8%). Non-pulmonary complications included renal failure (11, 2.6%), septicemia (5, 1.2%) and wound infection (4, 1.0%). The total number of complications in the mortality group was significantly higher compared to the survival group (33 complications for 74 patients [44.6%] vs. 110 complications for 342 patients [32.2%], respectively, p = 0.044]. There were 62 patients (18.1%) who developed pulmonary complications and 24 patients (7.0%) who developed infectious complications in the survival group compared with 11 patients (14.9%) with pulmonary and 7 patients (9.5%) with infectious complications in the mortality group (differences not significant). The number of patients who developed complications was similar between the different age groups (30 patients [28.6%] with complications in the 60-69 group, 24 patients [17.5%] in the 70-79 group and 35 patients [20.1%] in the ≥80 group, p = 0.146) (Table 2). In-hospital mortality rate was 17.8% (74/416). One patient who died (1.4%) was discharged from the hospital but died within 30 days of the trauma and was therefore defined as hospital mortality. Thirty-three of the patients (5.5%) died within the first 24 hours of admission to our unit. Univariate analysis of clinical parameters is shown in Table 3. An increased mortality rate was observed in the ≥80 group compared with their younger counterparts and this was statistically significant (23.6% [41/174], vs. 16.8% in the 70-79 group [23/137], and 9.5% in 60-69 group [10/105], p = 0.003) (Table 2). MOI did not appear to affect mortality rate, with the exception of burns which had the highest mortality (7/11 patients, 64.6%). All patients with burns over ≥20% of body surface area died. Data shown as mean (and SD), or number of patients (and percentage points)*. ISS Injury severity score, GCS Glasgow coma scale, AIS Abbreviated injury scale, INR International normalized ratio, ICU Intensive care unit. Multivariate analysis was performed to analyze predictors of in-hospital death. Variables which were significant on univariate analysis (Table 3) were entered into a stepwise forward regression model. Variables entered included age, ISS, CRF, number of co-morbidities, intubation upon arrival at the trauma unit, GCS upon arrival, international normalized ratio (INR) at arrival, and the requirement for ICU and/or blood transfusion. Older age, CRF, low GCS, high INR, and the need for intubation were all found to be predictors of in-hospital mortality (Table 4). In order to underline the clinical relevance of our results, we applied well-established clinical cutoff points and categorized age (<80 and ≥80), INR (<1.2 and ≥1.2), and GCS (3-8, 9-13, and 14-15). Subsequently, age ≥ 80 (OR 2.29), GCS < 14 upon admission (OR 4.12), intubation in ED (OR 3.32), CRF (OR 3.65) and INR ≥ 1.2 (OR 3.53) were found to be significant predictors of in-hospital mortality. OR Odds ratio, CI Confidence interval, GCS Glasgow coma scale, ED Emergency department, CRF Chronic renal failure, INR International normalized ratio. A six times greater mortality rate has been reported in elderly patients compared to younger trauma patients when taking into account the degree of injury. We analyzed data on severely injured geriatric trauma patients treated at our level I trauma center. The major finding of this study is that pre-hospital parameters of age, and CRF, and initial in-hospital findings of a low GCS, the need for intubation, and an elevated INR can predict in-hospital mortality following severe trauma in an elderly population. There is no consensus in the literature regarding the definition of a geriatric trauma patient and the age varies from 55 to 70 years old. Some have defined geriatric trauma as patients over the age of 65 years corresponding to retirement policies. Furthermore, the rapidly increasing demographic changes in the elderly population over 80 years of age have led to a differentiation between old and the very old. As previously been done, we divided our patients into 3 age categories: 60-69, 70-79 and ≥80. Our results show that the pattern of injury shifts gradually with these age groups. The overall severity of the trauma load and its impact on the patient’s anatomy and physiology is usually expressed as an ISS of ≥ 16. Application of this score to an elderly population has been shown to be an inconsistent predictor of mortality[12, 16]. A study by Tornetta et al addressed the factors affecting morbidity and mortality in elderly trauma patients. The study included 326 elderly trauma patients over the age of 60 who had suffered from blunt trauma. Mean age of the patients in the study was 72, mean ISS was 19.7 and overall mortality was 18%. Perdue et al found that mortality in elderly patients was twice that of younger patients with comparable ISS. In our study population, we found that on univariate analysis ISS was significantly higher in the non-survivor group (28.6 ± 10.9 vs. 21.7 ± 7.1, p < 0.0001). However, on multivariate analysis ISS was not a predictor of in-hospital mortality. Traumatic brain injury in geriatric patients has been recognized to result in a worse outcome when compared to younger counterparts, with a low admission GCS commonly recognized as a poor prognostic indicator. Head injury was predominant in all our age groups with a homogenous head AIS distribution. It was strongly associated with in-hospital mortality (p < 0.0001) and associated with other predictors of mortality: low GCS upon arrival and the need for pre-hospital intubation (both p < 0.0001). This finding was not surprising and is strongly supported in the literature[19–21]. It appears that in the elderly population, age and perhaps neurologic status upon arrival, as reflected in the need for intubation and GCS, are more consistent predictors of in-hospital mortality. Blood pressure and heart rate are not consistently the most sensitive indicators of physiologic distress in an elderly trauma patient. Given that a history of HTN and beta blockade use in the elderly population is not uncommon, these parameters may be unreliable. More so, these classic physiologic parameters are less reliable in the pre-hospital evaluation of the elderly patient, and consequently, an occult shock state may go unrecognized resulting in under-triage and evacuation to a non-trauma center. Thus, there is a need for additional clinical assessment tools in the elderly population to aid clinicians in diagnosis. In the elderly, pre-existing co-morbidities can adversely affect a patient's recovery from a traumatic injury. This can be attributed to physiological changes related to age as well as pre-existing co-morbidities and poly-pharmacy[24, 25]. Hollis et al have demonstrated that pre-existing medical conditions and increased age are independent risk factors of mortality after trauma. We examined co-morbidities which are well-known to affect survival. On univariate analysis only an elevated creatinine level and a previous diagnosis of CRF were associated with in-hospital mortality. Multivariate analysis showed CRF as a predictor of in-hospital mortality (OR 3.65, p = 0.005). It appears that other common medical conditions such as HTN, ischemic heart disease, and diabetes mellitus, or the number of co-morbidities, do not affect in-hospital mortality. In major trauma, mortality in the elderly was found to be nearly double compared to mortality in the younger age group and the complication death rate to be markedly higher, especially for pulmonary and infectious complications. It has been previously reported in orthopedic trauma patients with typical femoral fractures that pulmonary and infectious complications are predominant[28, 29]. In our population, pulmonary and infectious complications did not appear to affect survival. However, the total number of complications was higher in non-survivors compared with survivors (p = 0.04). Elderly trauma patients are often admitted to the ICU despite their potentially stable appearance because of their high propensity to deteriorate rapidly. Early transfer from the ED to the ICU allows the performance of thorough and continuous hemodynamic monitoring. In this setting, aggressive and targeted management can prevent hypoperfusion, reduce the incidence of multiple organ failure, improve survival, and allow a rapid diagnostic workup. As expected, we found that the requirement for ICU was significantly higher in the mortality group (71.6% vs. 50.6%, p = 0.001). Additionally, ICU admission was significantly higher in the 60-69 age group (67.6%), mainly due to more severe MOI, often MVC. However, on multivariate analysis, ICU stay was not a predictor of in-hospital mortality. Low-energy falls have been reported to account for only 9–11% of injury-related deaths in the general population. However, in patients over the age of 65 they account for more than 50% of traumatic deaths[30–32]. Our results showed that MOI and distribution of injury varied between the age groups. Greater than 80% of trauma admissions in the ≥80 group were caused by falls resulting primarily in head trauma (90%). This may be due to the poor overall condition of the frail, elderly patient who stumbles and loses balance at home. Although fall as MOI was significantly more common with increasing age, it did not affect in-hospital mortality. Our analysis has several potential limitations. EMS crews in the Jerusalem district utilize age ≥ 60 as a criterion to transport patients to our level I trauma center, the only such center in the area. This study may have thus represented a population bias and therefore be limited in its ability to extrapolate our findings to other institutions. Patients were not analyzed based on hemodynamic status upon arrival, because criteria for hemodynamic instability are not clear and differ in age groups and individuals receiving medical treatment for pre-existing cardiovascular diseases. The presence of co-morbidities was based on data collection from the trauma registry with the intrinsic potential for error. Finally, this study was a retrospective review and is therefore susceptible to the inherent limitations. Current trauma scoring systems are insufficient in directing management and predicting survival for elderly injured patients. We found that advanced age, especially age ≥80, low GCS, elevated INR, pre-existing CRF and the requirement for intubation on admission are the strongest independent predictors of mortality in elderly population following severe trauma. Further research comprising age and other medical-related parameters will help formulate more predictive trauma scores and advanced treatment algorithms to facilitate treatment. MB: study conception, analysis and interpretation of data, drafting of manuscript. DW: study conception, analysis and interpretation of data, drafting of manuscript. DK: acquisition of data, analysis and interpretation of data. TBA: statistical analysis, analysis and interpretation of data. AIR: study conception, drafting of manuscript, critical revision. MAG: acquisition of data, analysis and interpretation of data. RE: statistical analysis, drafting of manuscript, critical revision. GA: study conception, analysis and interpretation of data, drafting of manuscript, critical revision. All authors read and approved the final manuscript.